"Dean Haspiel provided a striking Billy Dogma panel, the first to ever be offered for sale, for the opening and exhibit. Fans would have recognized the panel from one of his most recent Dogma works, “The Last Romantic Antihero” posted on Trip City. The significance of the bridge scene to the narrative gave the ink sketch a particular poignancy as one of several repeated moments wherein Billy Dogma meets counterpart Jane Legit, bringing together different time-lines in a reboot of their love-driven adventures. Billy and Jane, strangers, pass each other under the gothic archways amid the taut wires in bright light and turn, frozen, at the same moment as the repeated motif of an ice-cream cone drops to the ground. 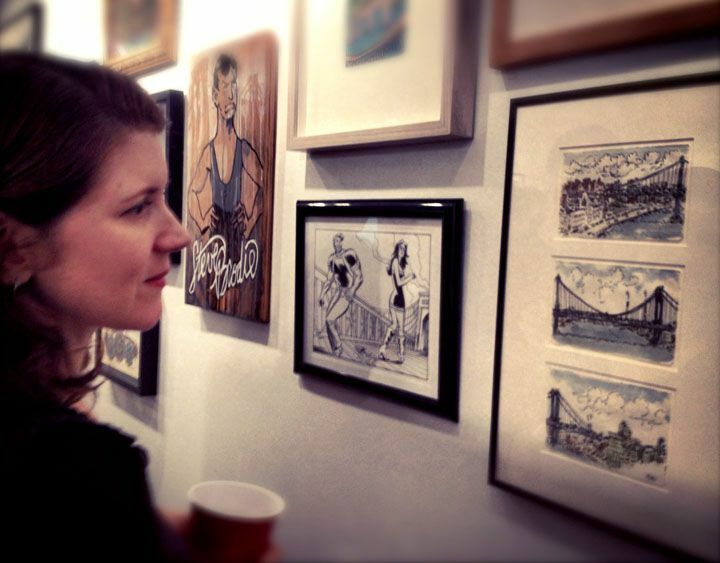 The inked panel conveyed starkly the human dramas we associate with the bridge, the backdrop and background character role it plays and its evocative presence as a ready-made symbol for the art Brooklynites create."